Just like lots of kids his age James is obsessed with LEGO. Honestly his bedroom looks like it could slot nicely alongside a display at LEGOLAND and not look out of place! Of course of all the LEGO James has his favourite bit and that has to be the characters and mini figures! He spends ages arranging them on his bedside table and its this first thing he builds when he gets a new set! So when I recently came across Fred's box I just knew he would love it! 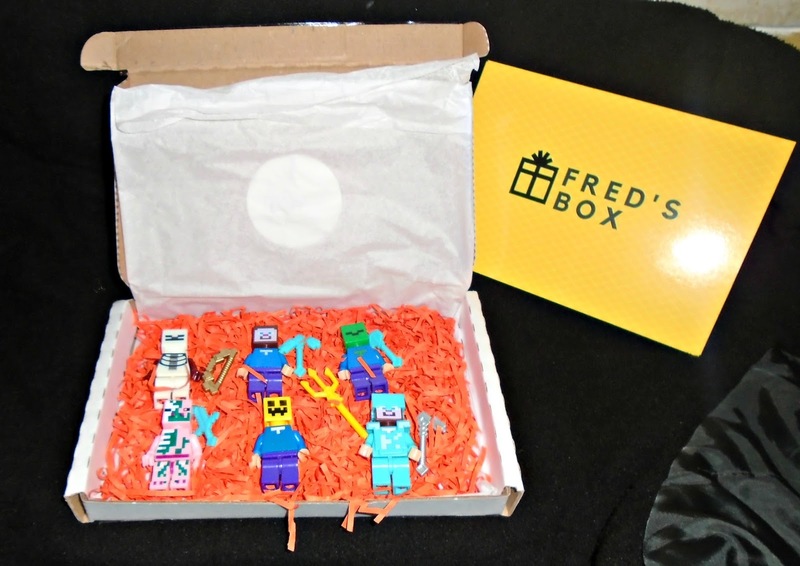 Fred's Box is a subscription service that sends a set of mini figures that are compatible with lots of other brick brands through your letter box each month depending on your subscription. Each month your Fed's Box will have a theme, this month was Minecraft for our box! You can even add a greetings card to your Fred's Box for an extra £2 which is great if you are choosing this as a one off gift. 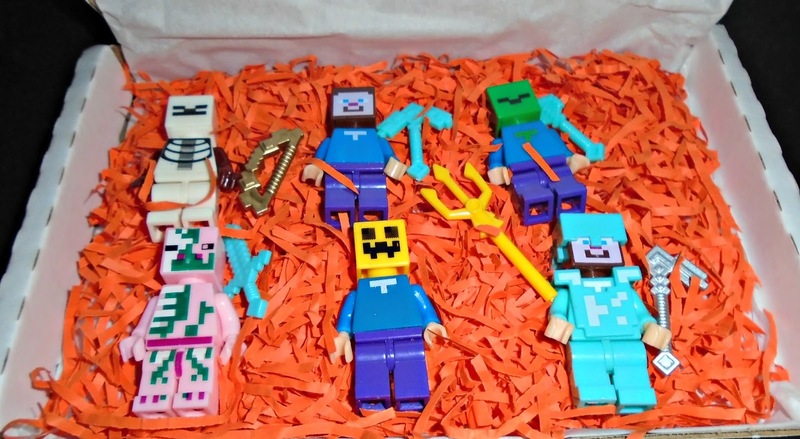 We received the Medium box which contains 6 mini figures and this months theme was Minecraft. As you can see there is so much detail that has gone in to each and every mini figure. Each figure also came with an accessory too which was a lovely added touch. All mini figures are compatible with LEGO and other brick building brands so you be rest assured they can be added to your existing collecting if you wish. Ordering your box couldn't be easier! You simply select the box size you want, select whether the box will be for a boy, girl or if you would like it to be unisex. At this point you also choose your subscription length and are given the option to add a greetings card. That's it, one you have ordered and paid for your Fred's Box just sit back and wait for it to land or your doorstep. Boxes will arrive between the 20th and 25th of every month (or within a week of ordering if you have ordered a one off box) and all box prices include free postage. A big bonus for us is that the Fred's Box fits easily through the letter box so you don't need to worry about waiting in for it or missing it (great when you seem to be in and out of the house for school runs!!). With so many characters available and more new ones being added all the time, its very unlikely you would be receiving the same characters over again so its always a fun exciting surprise when your Freds Box lands of your doorstep. Is Fred's Box something you think your child would like? Or perhaps you know a grown up who would love a subscription to maybe collect these great figures? If so why not pop over the the Fred's Box website and check out all the subscriptions available and order your very own Fred's Box.